The venerated and indigenous American Elm, the most common Elm variety in the Chicago metro, is particularly susceptible. Sometimes progression of Dutch Elm Disease (DED) can span two or more years within an Elm, but with few exceptions DED kills the tree once infected. Induced by the fungus, Ophiostoma Novo-ulmi, DED is classified a "vascular wilt" disease because it constricts the water-conducting xylem tissue of a tree. 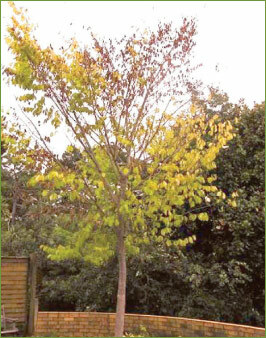 Wilting or "flagging", then yellowing and dropping of the leaves, is the only external symptom and often consumes the crown of the tree within months of onset. It is largely spread by a vector, the Elm Bark Beetle, but sometimes through the natural grafting of roots of an infected Elm to roots of a healthy Elm nearby. Detection and prompt removal of dying Elms is critical to slowing the spread of DED throughout a neighborhood. "Eradicative treatment", or pruning of infected branches and/or injection of a fungicide to arrest DED within a tree is possible, but unlikely. Since this must be done at an early stage of infection, by the time symptoms are noticed it is usually too late. Therefore, practical management of DED is best done preventively with an appropriate fungicide and maintenance of tree health. Imported on Elm logs from Holland, DED is a fungus that has killed an estimated 100 million Elms in the U.S. since first reported in 1928. It is believed to have arrived in the Chicago area as early as 1954. Fortunately, there remain possibly hundreds of thousands of Elm trees here in the metropolitan area. Unfortunately, so too remains this very active, deadly strain of DED, which kills tens of thousands of these surviving Elms every year. 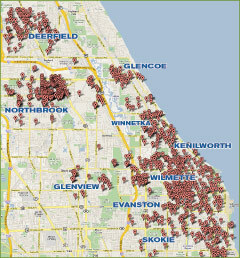 DED kills tens of thousands of surviving Elms in the Chicago area every year. 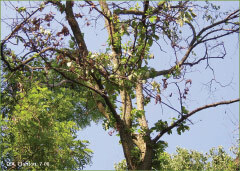 The City of Evanston, after a major outbreak in 2004 that killed more than 800 Elms, began a DED prevention program using the fungicide Arbotect 20-S. Almost 2,200 Elms have been preventively treated on public and private property under this program, done mostly in 2008. Macro-infusion process used to deliver this fungicide into the vascular system of the tree is done properly—a considerable and diligent task. DED does not enter the tree through roots from another, nearby infected Elm. Elm is relatively healthy, allowing effective translocation of the fungicide throughout the tree. Preventive treatment of Dutch Elm Disease with Arbotect 20-S can be done most of the growing season. Treatments are effective for three years. 1,150 Elms destroyed by DED in 2008. Not all municipalities on map were requested DED-loss figures, Glenview furnished incomplete records, and Northfield refused cooperation. Parkway Elm on Kenilworth Ave, Wilmette in late stage. Click the photo to enlarge. Small Elm in late stage. Click the photo to enlarge.